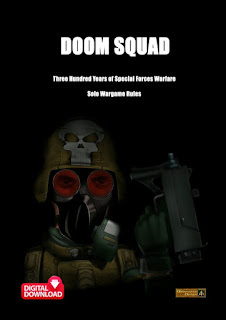 Yes a full thirty six page magazine about Flintloque, Firefight, DarkeStorme, Firefight, Age of Might and Steel and Alien Squad Leader is online for free. Back in 2010 Alternative Armies published a short lived paper magazine called Barking Irons. It featured content for many of our game systems and developed a loyal following right from the start. The paper magazines are now sold out and while elements of each can be had online they are not presented anywhere in full to be read. With this in mind and also that we are not likely to be publishing more issues of the magazine we have placed this issue in full on the Notables Yahoo Group. Its free and for you to read. There are some six hundred and fifty members of the Notables Yahoo Group and its a place where there is more than 100mb of free files, hundreds of pictures, a legacy of more than twenty thousand messages along with wargamers to talk to. I also frequent the group several times a day and I am always happy to pitch in on all conversations including items not to appear here. Its well worth joining this Yahoo Group and while you must apply to join this is just a formality and I will sign you in (which you need do only once) where you can pull up a virtual armchair and talk about our games and miniatures. Here is the link: Notables Group. Once in the group just click on the link for FILES and then on the Barking Irons folder to get the free PDFs. The next issue will be published onto the group in a few weeks time as well. Here is what is in this issue. 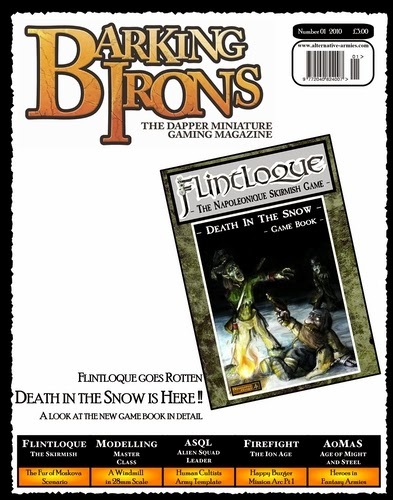 An in depth look at the new Flintloque game book, the second in the series, for 3rd edition which sees the Undead join the fray. Includes a review of War in Catalucia for comparison. By G. Syme with D. Toone. Flintloque scenario for two players (or solo play) which sees the Bella Manicotti Todoroni face off against some very hungry Joccian hussars. By B.Dyer. Part one of the Happy Burger arc for Firefight 2.0 the 28mm science fiction system set in the Ion Age. Emeritas Hughes returns in the mission ‘Drive Through’; can he survive until help arrives? By G. Syme. Flintloque scenario for one player ( solo play). Can your Finklestein Dogmen, caught unawares at camp outside the charnel city manage to escape the Undead in time? By G.Syme. The new Human Cultist army template for the fantastic Alien Squad Leader (ASQL) 15mm science fiction system. By A. Self. The theory and added mechanics for the effective use of Heroes in the Age of Might and Steel (AoMaS) 15mm Fantasy system. By S. Hazuka. Part one of the introductory series in how to be a highly effective Flintloque player. The overview comes first. By M. White. Snakes and Stones will break your bones. Get the ‘moist’ from Lizardmen in the Age of Might and Steel (AoMaS) 15mm Fantasy system. By S. Hazuka. Q&A - Got a Question for us? Ask us! So go along to the Notables Yahoo Group and download it as four PDF's from the file section. Enjoy!